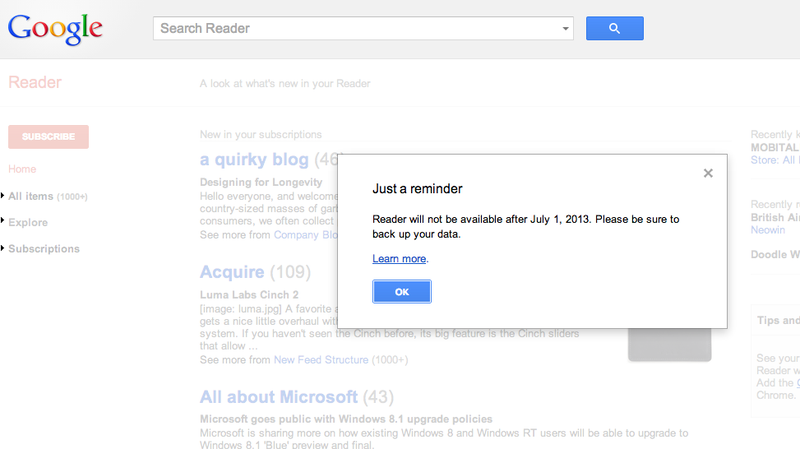 When Google announced back in March that it would be killing off Reader on July 1st, a lot of people freaked out. At the time Google cited a decline in usage for its demise beyond a general narrowing of focus on core products. Today, though, Google has clarified to Wired why it killed Reader, and what will fill the void. And it's pretty sad. Richard Gringras, Senior Director of News & Social Products at Google, had this to say: "As a culture we have moved into a realm where the consumption of news is a near-constant process." While that may be partially true, it's probably more likely that Google's data mining efforts proved fruitless and a waste of time. As we've migrated to services like Twitter and are consuming more news on mobile devices, Reader simply stopped being useful for Google—not users. So what is Google's alternative to Reader? The existing one-two combination of Now and Plus, of course. Except that others have tried and failed at Now's strategy of using AI to serve up relevant content based on user habits and whatnot. Services like Zite have tried for years to dig up stories you might like based on what you already read and enjoyed. Recommendations simply don't work. Pandora can't do it. Netflix can't really do it either. Personal taste just isn't something that a machine can interpret. Hell, humans can barely do that. Look, it's one thing to know when I might want to read the news, but it's another thing to glean what I might want to read at that time. Google's not even all that great at serving up relevant ads after years and years, so how are they going to figure out what news we want to read? RIP Reader. I'll pour one out for you on July 1st.